It just arrived back from OSH Park and I fitted everything together, and low and behold it fit. Following the datasheet physical dimensions in the CAD program amazingly works better than randomly choosing a hole size. 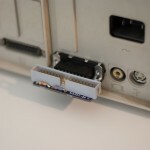 The following pictures show the soldered result, the adapter connected to the IIgs and my RGB monitor perched atop the IIgs. It looks pretty good, but I don’t think that is exactly safe (especially in earthquake prone southern California. 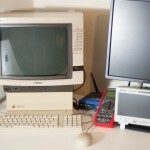 I think I’ll build/find a platform so that the computer can sit underneath the monitor but not support the weight. Overall this has worked out really well, and I’m pretty happy with the result. If I have time and inclination, I may use this project as a chance to design a custom enclosure for the PCB for 3D printing. Great work on the CRT RBG monitor adapter. 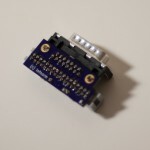 This requires an RGB to VGA converter card (external) and to connect pin 3 to pin 15 on the IIgs motherboard (soldered jumper wire). 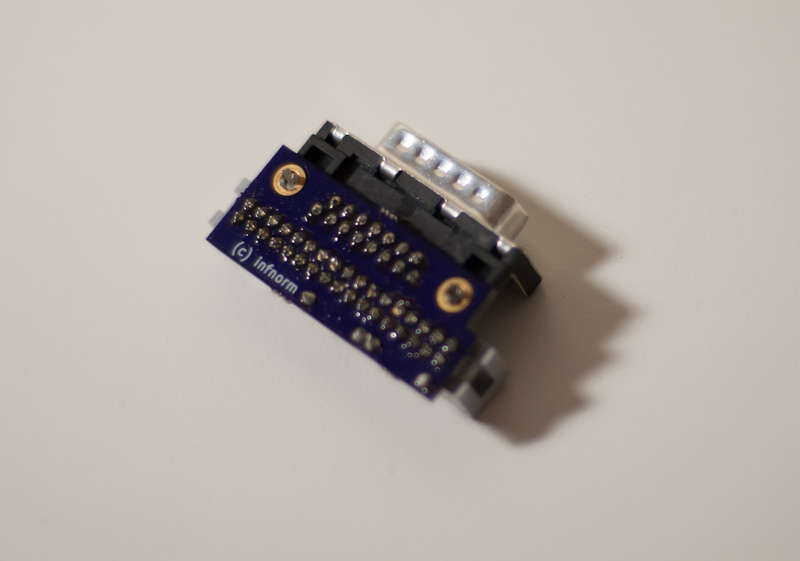 You also need an Apple RGB to VGA adapter to use the card with VGA cables (used with older Macs). Although the picture looked good, the IIgs power supply burned out. I’m not sure if the motherboard mod or card caused this or if the IIgs power supply simply gave out due to age. Based on your experience, would this mod cause the power supply to become overloaded? I just don’t know enough about the IIgs and your electronic experience sounds much more advanced. I’m trying to research this so I know enough next time to avoid frying another power supply. Looking at it casually, I doubt the power supply would have burnt out from that. Although, instead of a jumper you could have used a 22 ohm resistor instead which would have limited the current somewhat. The GBS-8220 should not be presenting such low impedance that any of the monitor outputs require much current. Apple IIgs power supplies are notorious for giving out from what I read, so I would guess it is just coincidence. Obviously, if you had accidentally shorted anything else out rather than just connecting the jumper between the two desired pins, that could be another story. Check your jumper points against ground (the metal outer shell of the monitor connector should be ground) and see if you are dead shorting anything before trying a new power supply. Hope that helps. Good luck! Found your site while I was doing a search on RGB and the IIgs. Then I looked through my stuff and have that monitor also, my TV for years. Do you still have any boards left from OSH park, or did you happen to share it on OSH park, I did a quick search but did not see it. I figured I would ask since you’ve already done the work. Great Job. Thanks! I do probably have extra boards, but I have moved since I did it. If I can find it, I’m happy to send you one of the boards. Email me at infnorm@gmail.com your address. 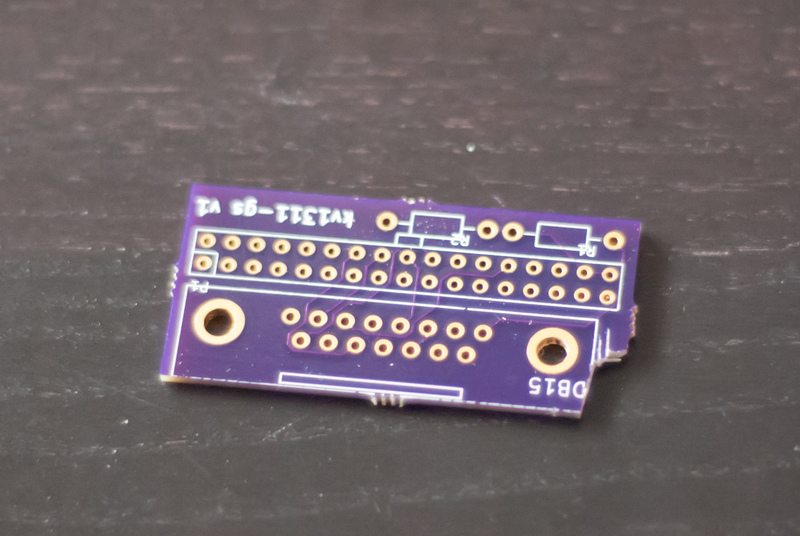 My project is here https://oshpark.com/profiles/infnorm for others’ future reference.